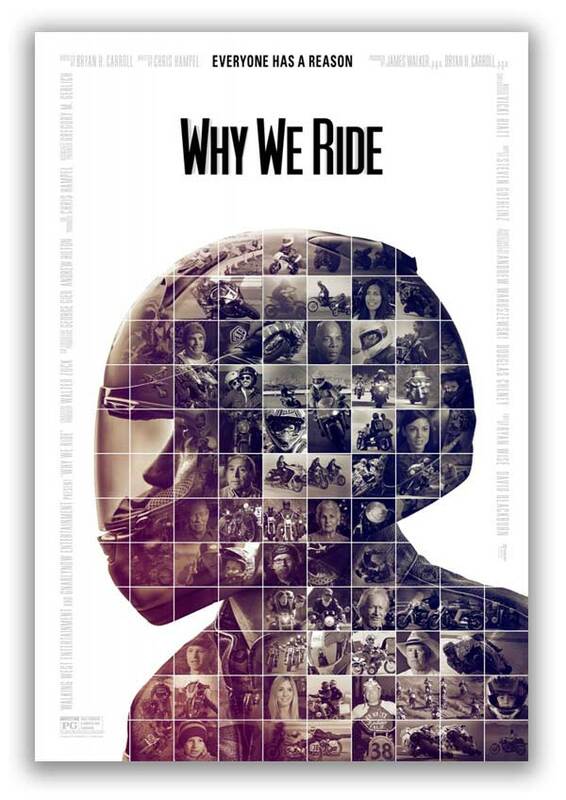 Yesterday I saw the new documentary movie “Why We Ride” at the AMC 14 theaters in San Francisco along with a hundred or so other motorcycle fanatics. I’ve never seen so many helmets in a theater at one time. I thoroughly enjoyed the movie which walked in the footsteps of Bruce Brown’s 1971 classic “On Any Sunday” and many of Warren Miller’s ski films. The cinematography was outstanding and the flow of the film worked well. But recently, I have been watching a lot of motorcycling documentaries and it seemed to me that what Why We Ride lacked was why a non-motorcyclists would enjoy the movie. A few months ago, I discovered Evan McGregor’s “Long Way Round” and “Long Way Down” mini-series. I recommended those to my sister who has no interest in motorcycling whatsoever. She was captivated by the story, partly because of the adventure, but mostly because of the incredible friendship that comes across onscreen between Ewan and Charlie. That was the real story of Long War Round, the phenomenal bond between two blokes, who happen to ride motorcycles and who embark on an incredible adventure. By contrast, Why We Ride seemed to be more of a public service announcement for motorcycling, especially for the family-friendly aspects of the sport. Don’t get me wrong, I loved the film and think that a love letter about motorcycling is something that is needed. The only problem with Why We Ride is that it will only be seen by people who already ride. There is no overarching story that would cause a non-motorcyclist to care about the movie. And maybe that is okay. Maybe that is the way that all enthusiast documentaries about a specific sport our activity end up. Maybe this movie will play well with the seven million or so motorcyclists in the U.S. and maybe that’s enough. But I can’t help but wish for a deeper story that would keep me coming back to the movie time and again, or to recommend it to my non-moto friends. Why We Ride, is not one of those movies. It will remain as a beautifully shot and well told story about motorcycling, for motorcyclists. Or, for a husband to convince his wife that it’s okay to get mini-dirt bikes for the kids. There is a LOT of that message in the movie. So congratulations to the director and producer. And know that I, and many others, will indeed buy the DVD. But please also take this as encouragement to keep going and take your prodigious cinematography and moviemaking skills and tell other, deeper stories about the human condition on two wheels. In my opinion, only then will you really get across the story of Why We Ride to those who don’t already know the answer. What did you think? Please leave a comment below. This entry was posted in Gear Reviews, Motorcycle Culture, Motorcycling and tagged motorcycle, motorcycling, Why We Ride by pradsliff. Bookmark the permalink.